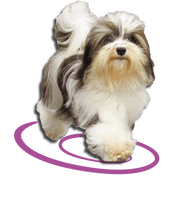 Havanese puppies and dogs available from other breeders- Scroll all way down to see. On this page you will find puppies available by some of my friend's litters as well as litters I co-own or co-bred with my friends and family. When a person breeds only couple girls to the only male they have, they have a very restricted breeding program. By breeding as a group of friends, we are able to use each other's males, trade puppies and therefore keep our lines diverse and allows us more options to produce the highest quality puppies we can without keeping so many dogs. So the puppies you find on this page are not raised here but are raised with same standard of quality. ​Please email or call me at 941-685-6658 for more information, pricing, etc. Puppies prices are all $2000 and up on this page. Please check with me about shipping availability as some of these breeders will ship. Please email, text or call me for more details on any pup your interested in. These puppies are not MY puppies, but ARE equal quality puppies. These puppies are sold on the same contract, guarantee and are also top quality house raised and spoiled. These puppies typically are not living here with me. They are raised, kept, trained, by there individual breeders. However, they can be brought over here during any visit for you to meet, just ask to see any that you like and I will see that they are here for you to meet along with mine. Some puppies have arrived. Below are the photos of the new babies. Now taking deposits to reserve your choice. Puppies from several other breeders posted below. They are raised at there homes. But all available to be reserved. Contact me for details and or to meet your favorites.